Brooklyn Museum entrance. Photo by Nancy Bishop. Frida Kahlo: Appearances Can Be Deceiving, Brooklyn Museum. (Photo: Jonathan Dorado). Jewelry exhibit cases at MAD. Photo by Nancy Bishop. Sanford Biggers. Assorted fabrics, spray paint, acrylic on antique quilts. Photo by Nancy Bishop. MAD wall hanging Bishop photo. The Brooklyn Museum is a grand art museum housed in an 1893 building designed by McKim, Mead and White. You enter the museum, not through its 19th century Beaux Arts façade, but through a two-story glass entrance pavilion that’s a slight grade downward. Despite its modern galleries, elements of the original building are still visible in the Beaux Arts Court, restored in 2002, and other interior elements. 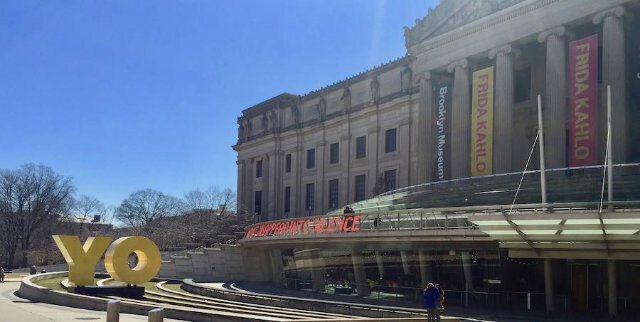 The Brooklyn Museum is currently showing a large and complex exhibit on the life and work of Mexican artist and pop culture icon Frida Kahlo. I also visited a smaller museum this week: the Museum of Arts and Design or MAD, a small modern gem in Columbus Circle, near the intersection of 58th and Broadway. The museum specializes in the work of artists, artisans and designers with exhibits of craft and design. My favorite exhibit—The Future of Craft—featured work in fabrics, textiles, and found objects and materials. 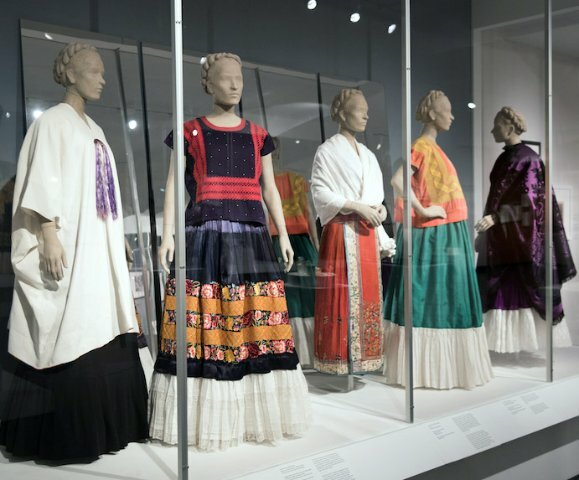 The exhibit title alludes to Kahlo’s practice of wearing Tehuana native tunics and long skirts with flounces to hide the evidence of the serious disabilities she lived with for most of her life. She had polio as a child and then, at age 18, was involved in a serious accident when the bus she was riding in collided with a trolley car. She suffered a broken spinal column, collarbone and pelvis, a shattered right leg and a dislocated right foot. The exhibit, which includes about 150 photographs plus other works, features only a small number of Kahlo’s own paintings. It is devoted almost entirely to her family, her early life, her disability, and her interest in her own visual identity and representation of Mexican cultural heritage, especially in clothing and jewelry. Despite the small presence of Kahlo’s own paintings, the exhibit tells a fascinating story of a woman artist and activist. She married muralist Diego Rivera in 1929 and they had a tempestuous relationship, including affairs on both sides, divorce and remarriage. She was a branding genius and has become a pop culture icon since her death in 1954 at the age of 47. Her German-born father, Guillermo Kahlo, was a photographer and Frida worked for him as she was growing up and thus began her interest in the visual image. The first room of the exhibit includes many family photos and self-portraits taken by Guillermo. 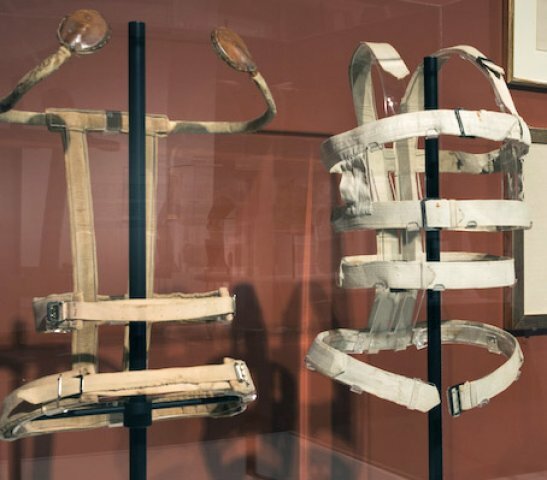 Another gallery focuses on art and disability, showing the leather corsets she wore to support her spine, and shoes and boots reconstructed to adjust for her foot problems and the length difference between her legs. One of the largest galleries displays mannequins wearing many of the garments she wore, such as huipils (native blouse or tunic), enaguas (skirts or petticoats), rebozos (shawls) and starched white resplandor headdresses, some of which covered her bodice as well as her head. Small glass cases show her jewelry and cosmetics. There are also films in side galleries, mostly silent, one of which shows women wearing local dress. Many of the materials in this exhibit are shown for the first time in the U.S. They’re drawn from the contents of the La Casa Azul (Blue House) she shared with Rivera in Mexico City. These possessions were locked away after he died in 1957 and only recently released. 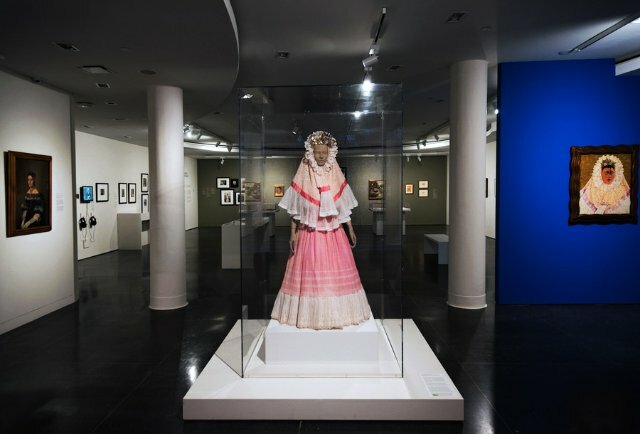 The Brooklyn Museum exhibition is based on exhibitions at the Frida Kahlo Museum in Mexico City (2012), curated by Circe Henestrosa; and the V&A London exhibit (2018), curated by Claire Wilcox and Henestrosa, with Gannit Ankori as curatorial adviser. 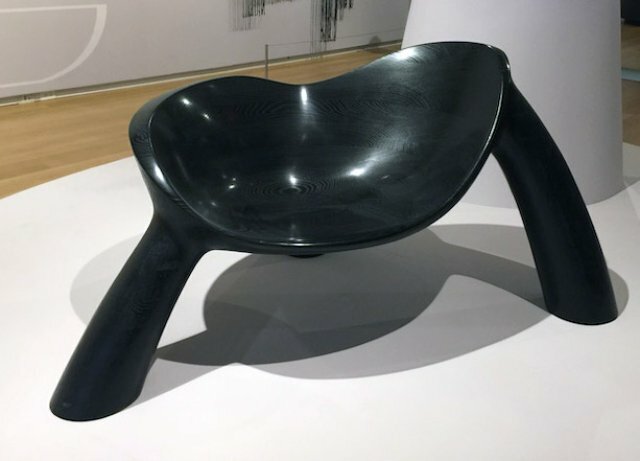 Henestrosa was very involved and instrumental in working with the Brooklyn Museum curators, Catherine Morris and Lisa Small, in the presentation of this show. Kahlo posed frequently for famous photographers of the day, includingTina Modotti, Carl Van Vechten, Imogen Cunningham, Edward Weston, Manuel Alvarez Bravo and filmmaker Miguel Covarrubias, as well as for her friend and photographer, Nickolas Muray. And she painted and drew many self-portraits. Indeed, for a woman crippled by fate and traffic accidents, whose look was exotic and intriguing, but not classically beautiful, she obsessively ensured there were many likenesses of herself in every way. What is this obsession in posing and having her image duplicated for the masses? The exhibit includes some of Kahlo’s actual cosmetics, which she used with care, especially vivid lipstick. So she was aware of and concerned about her appearance. But she made no effort to remove the more-than-faint moustache on her upper lip or to tweeze that unibrow into a more fashionable look. Kahlo’s obsession with self-portraiture is fascinating. Today she might be teaching branding through art at an Ivy League school—and she surely would be one of those people who adds her own photo to every Facebook post. Right now, 862,000 people follow the Frida Kahlo Instagram account. She’s the most popular artist on Instagram, followed by Andy Warhol and Vincent Van Gogh. Her official Facebook page has 6.3 million followers. Kahlo was an outspoken communist and supporter of leftist causes in the 1930s and ‘40s. (She joined the Young Communist League in 1927.) She and Rivera raised money for the Mexicans who joined the International Brigades to fight against Franco in the Spanish Civil War. She also helped arrange the immigration of 400 refugees from that war to come to Mexico. During the rise of the Nazis in Germany, Kahlo and Rivera claimed Jewish blood in solidarity. Unfortunately, only about a dozen of her own paintings are shown in the exhibit. There’s the famous “Self Portrait with Monkeys” from 1943 and “Self-Portrait as a Tehuana (Diego on My Mind),” also 1943, in which she paints an image of Rivera on her forehead, just above the unibrow. Her face is framed in a stiff white resplandor. 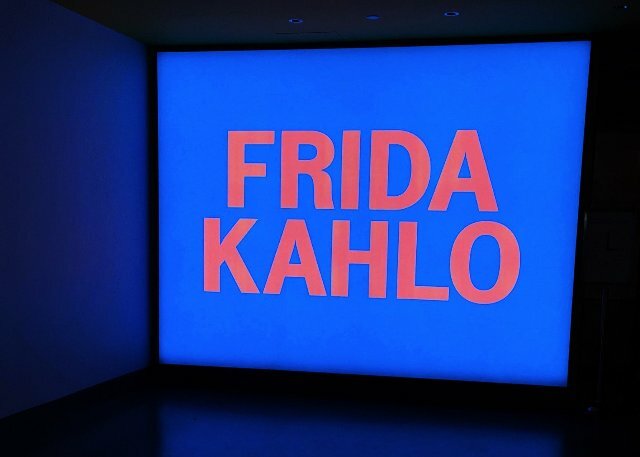 Frida Kahlo: Appearances Can Be Deceiving continues through May 12 at the Brooklyn Museum, 200 Eastern Parkway. Tickets and info at the museum’s website. The exhibit is not scheduled to transfer to any other museums. The MAD museum is new (compared to the Met and Brooklyn), opened in 1956 as the Museum of Contemporary Crafts and operating under similar designations until its name and mission were changed to the current version in 2002. The MAD designation is intended to reflect the institution’s increasingly interdisciplinary focus. MAD moved into its newly designed Columbus Circle home in 2008. When I visited, only three floors were open to visitors because a new exhibit is being installed. (Too Fast to Live, Too Young to Die: Punk Graphics, 1976–1986 opens April 9 and I’m so sorry to miss it.) 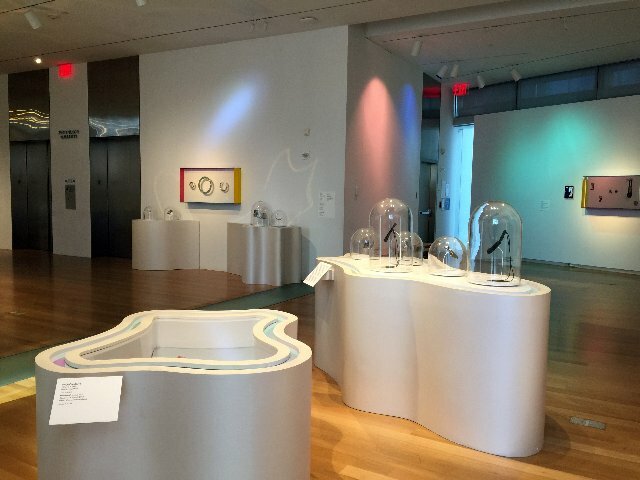 I visited the jewelry exhibit (Non-Stick Nostalgia: Y2K Retrofuturism in Contemporary Jewelry) and admired the exhibit cases as well as the jewelry. 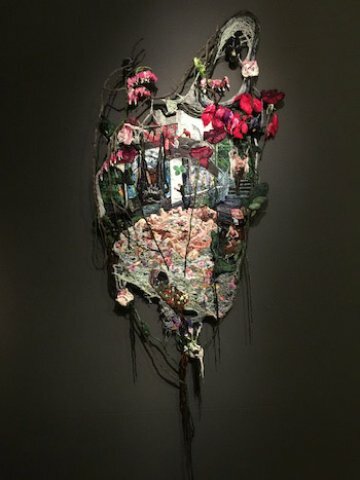 The exhibit titled The Future of Craft features fabric and found objects work. 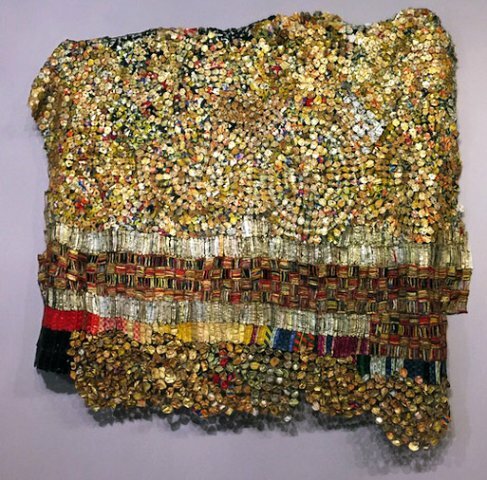 There are fabric hangings of many elements including quilt pieces, aluminum liquor bottle caps, and threaded transparent tape (woven into a shimmering coat). There’s also an excellent restaurant, on the ninth floor of the museum, with fabulous views looking north toward Lincoln Center and the park plus an intriguing menu of fine food and perfect service. Robert NYC is open for brunch on weekends, lunch on weekdays, dinner seven days, and for small plates, desserts and beverages in the afternoon.